A relative grieves as a Red Cross burial team prepares to remove the body of Ofori Gweah, who died of Ebola‚Äôs telltale symptoms, in a riverside area called Rock Spring Valley in central Monrovia, Liberia. A relative grieves as a Red Cross burial team prepares to remove the body of Ofori Gweah, who died of Ebola‚Äôs telltale symptoms, in a riverside area called Rock Spring Valley in central Monrovia, Liberia, September 18, 2014. 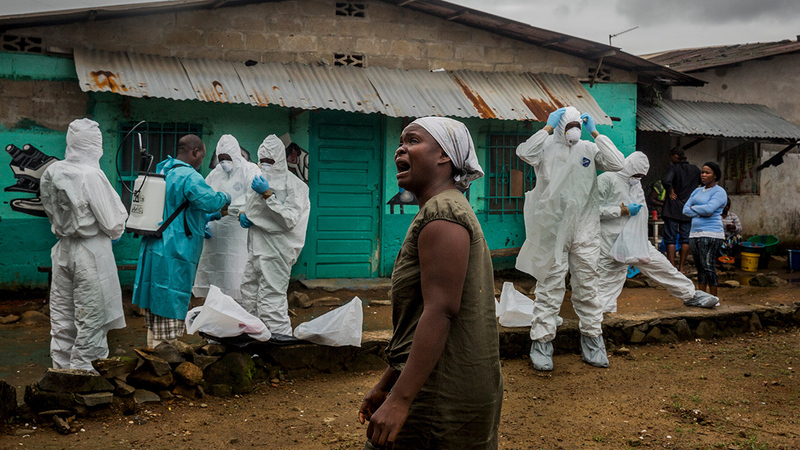 Daniel Berehulak was awarded the Pulitzer Prize for feature photography on April 20, 2015, for his coverage of the Ebola outbreak in West Africa for The New York Times. Picture taken September 18, 2014. REUTERS/Daniel Berehulak/The New York Times/Handout via Reuters ATTENTION EDITORS – NO SALES. NO ARCHIVES. FOR EDITORIAL USE ONLY. NOT FOR SALE FOR MARKETING OR ADVERTISING CAMPAIGNS. THIS IMAGE HAS BEEN SUPPLIED BY A THIRD PARTY. IT IS DISTRIBUTED, EXACTLY AS RECEIVED BY REUTERS, AS A SERVICE TO CLIENTS. NO COMMERCIAL USE.